Yashio Factory is located in the tuning hot-spot of Saitama Prefecture located right outside of Tokyo. Established in the early 80's as a Radiator shop the company has grown to become well known throughout the motorsports scene. Okamura Kazuyoshi better known as Oka-chan is the founder and owner, builder and driver along with mascot of the company. 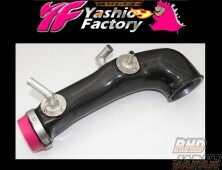 Well known for building some of the most beautifu...READ MORE lly constructed S-Chassis machines on the Drift and Circuit scene finished off with Yashio Factory signature pink.